The Gauer Flo-Rak Division is proud to announce the expansion of our roller track capabilities through acquisition. You can find new items listed in our Flo-Trak product page. Like Gauer, Roll-Rite was one of the first manufacturers of the roller track style of carton flow. Walter Gauer actually aided his friend, Stan Samuels of Unarco, with the original design of this type of track. It is only fitting that Roll Rite’s equipment has come back to where carton flow shelving was first manufactured. The design of this style track has been modified a number of times throughout the years, but has kept its backwards compatibility to older shelves. If you have a need to retrofit your existing shelves, we are happy to help. 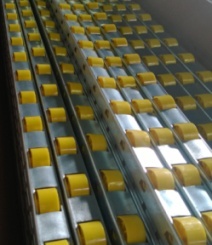 If you would like to purchase this style of Steel Pivot-Axle Track for your current project, please contact Unarco Material Handling or a Gauer distributor.